Doc Marquis wrote a book entitled ‘Secrets of the Illuminati doc ‘. While this topic has been explored before, no author has been able to bring a truly occultic angle to the discussion. In other words, Marquis looks at the plan to bring in the New World Order from the viewpoint of a former witch. In his book, Marquis includes a chapter entitled, “Is It Catholicism Or Witchcraft?” At the beginning of this chapter, Marquis makes a quite startling statement, “I must emphatically state that Catholicism and witchcraft are one and the same…there is no difference between witchcraft and Catholicism.” Then, Marquis examines Catholicism and witchcraft from the vantage point of a former witch. 2. The golden goblet known as a chalice. 3. Colored candles used in services. 4. The use of incense. 5. The use of bells in the ceremony. 7. The use of Latin in services. 8. The use of a golden scepter in giving a large blessing to the people. 9. Common belief in Purgatory. 10. The common belief in the host. 11. Common belief in the five elements. To practice certain metaphysical rites, such as the casting of certain spells or to honor occult deities. To hold the tools of magic. The Roman Catholic altar also holds their tools of their magic, and they daily perform human sacrifice. Remember, we are looking at this subject through the eyes of a former high-level witch who is now a born-again Christian. This daily human sacrifice is performed according to the false belief in “transubstantiation”, the belief that the priest magically transforms the wafer into Jesus’ body and the wine into His blood. Marquis states, “In other words, every day Christ is being reincarnated and then sacrificed.. they perform daily their human sacrifice in which Christ is …sacrificed for their sins.” It is shocking to realize that the Roman Catholics are daily performing human sacrifice in a manner similar to that of witches throughout the centuries. 2. The Catholic Golden Goblet, or Chalice. “It is this cup that the wine poured into it becomes the…literal blood of Christ. When a witch does a human sacrifice, after the victim’s throat is sliced open, the spilled blood will be collected in a chalice, just as the Catholics do, except the witch’s chalice holds the real thing.” In Satan’s eyes, the Catholics are performing the same rite as the witches. 5. Bells are also utilized by both Roman Catholics and witches. The bells are actually baptized, and in both witchcraft and Catholicism, altar boys attend the priest in sounding the bells. 6. Witches were praying to images or statues for many centuries before Catholics began the practice. 8. 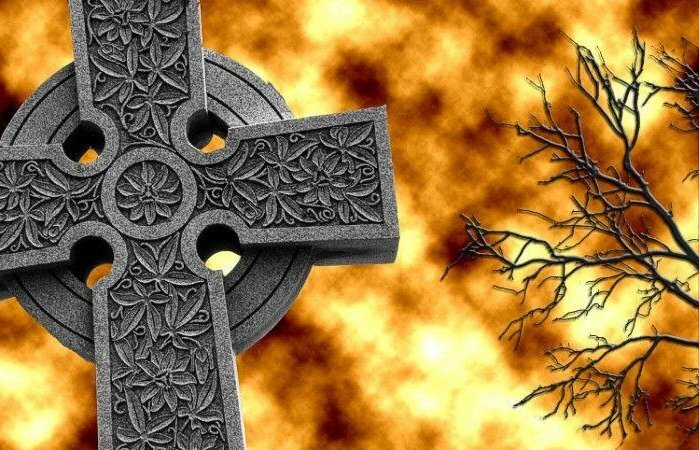 “…when the Pope, Cardinals, or priests want to give a huge blessing, they will take out a golden scepter, or wand, dip it in holy water, and then wave it on the people…wands are nothing new in the occult. When a witch wants to direct his power he can do it by means of wands.” He can also control the demonic forces at his disposal by using a wand to consecrate a circle with a pentacle inside. Holy water is also used by a witch to purify himself and his instruments, and the water is made holy in both witchcraft and Catholicism by mixing water with salt. 9. The teaching of Purgatory is not found in the Bible. According to Catholic catechism, Purgatory is described as “a logically deduced place. Since a Catholic could not go straight to heaven if he had sinned, and since he could not go to hell if he had not died in mortal sin, there had to be a place in between where he could be purified” — Purgatory. However, the belief in Purgatory is “totally occultic in origin”. Witchcraft teaches that after a person goes through Purgatory, he is reincarnated and is more powerful in his next life than he was before. After several reincarnations, he will become purified enough to live with the gods and goddesses, precisely the same end as the Catholics teach. 10. Both Catholics and Witches teach that the host becomes the actual body of their respective gods. To the Roman Catholic, the host becomes the actual body of Jesus Christ; the witch believes the host actually becomes the body of their pagan deity, “I.H.S. — or Iris, Horus, and Semiramis”. This concept is known in both circles as transsubstantiation. Related article: Why Is The Pope’s Mitre Shaped Like A Fish? 11. Both witchcraft and Roman Catholicism teach that the universe is comprised of five elements: Spirit, Water, Air, Fire, and Earth. These occultic five elements are also found in the Catholic mass. Spirit — of the wafer god they sacrifice daily. Earth — The elements of the wafer come from the earth in agriculture, and the flesh of their sacrificed deity, Jesus Christ, also came from the earth. Doc Marquis’s conclusion is inescapable and damning: The practice of occultism has come full circle from ancient Babylon to the Roman Catholic Institution today.